I at first want to thank the 100’s of people who stopped by our booth at the Spruce Meadows X-mas Fair. The interest shown by so many about the plight of our wild horses was inspirational to say the least. It was an amazing two weekends, with a record number of calendars being sold. We also ran out of our 1000 brochures due to the interest shown. I also want to thank all of you who took a few moments, when you got home, to e-mail Diana McQueen the Minister in charge of the wild horses, requesting that she not authorize a 2012/13 capture season. In that regards, the Minister still has not made any decision in regards to this matter. The report drawn up by an independent company, with input from all stakeholders including WHOAS, is still being reviewed by the ESRD. Before being made public, those of us that had input will be able to review it to assure that our information is accurate. The whole purpose of this report and study is to come up with a viable management strategy for the wild horses. 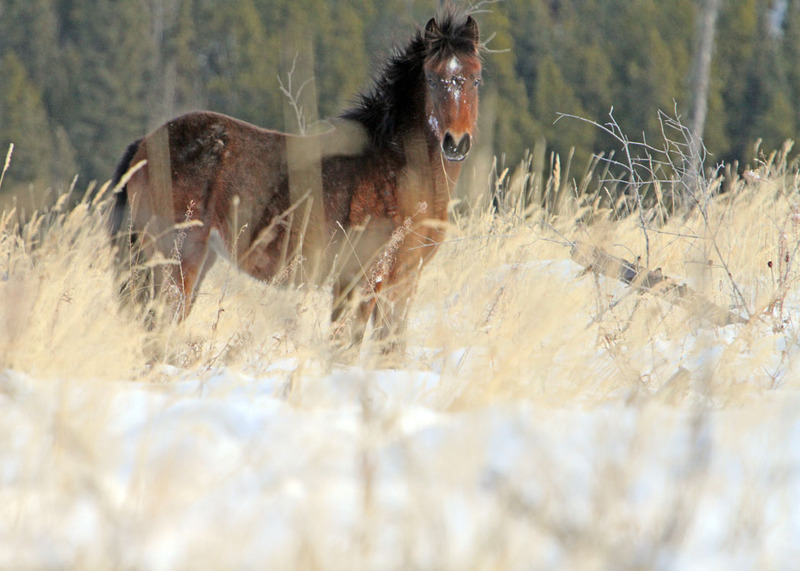 WHOAS still strongly believes that with the past two years of capturing over 300 head of wild horses and with the toll that this spring took of the wild horse foals, no season is necessary. We also believe that our management strategy would assure that no more wild horses would have to go for slaughter as in the past. Wildrose MLA Joe Anglin, with the help of a couple of WHOAS members has put together a paper to present in the legislature. He was to have had the opportunity to do this on Wednesday, November 28/12, however due to events within the legislature he was unable. It is still hoped that his paper, calling for the wild horses to be designated a Heritage Species and given proper protection, will be introduced shortly. 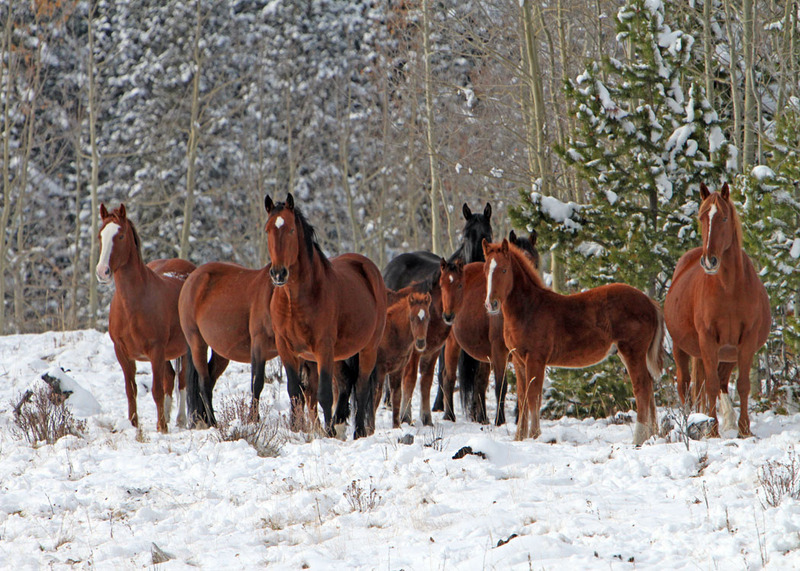 As for the horses themselves, I am finding again that they all appear to be in excellent shape despite the fact that it has been a very cold November with a good amount of snow already accumulating in wild horse country. Hunting season is at the end and soon the back country will settle down, allowing all the creatures to also settle down. At this time of the year the foals are looking so good, as you can see with this pretty girl. 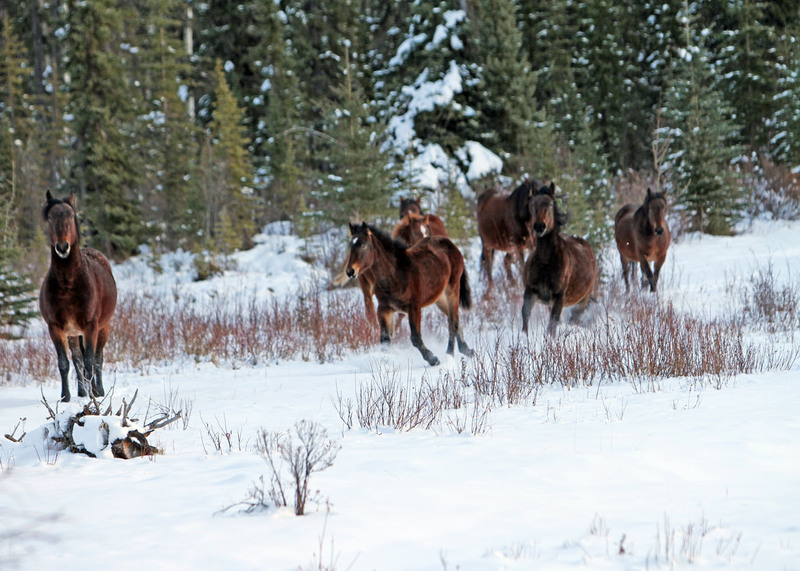 There is lots of forage and so unless the snows get overwhelming, the horses along with the other wildlife should be able to survive the hardships that the cold and snow of winter bring. Some of the mares are already showing signs of being in foal. It is still amazing to me that these wild horse mares will do everything they can to survive and produce a healthy foal in the spring time. Sometimes when you first see them with their new born in the spring, they look so rough and are so skinny, yet in a few weeks of good grass they have bounced back and the family does just fine. In the years that I have spent studying the wild horses I have spent countless hours researching the history of our first nations people and our early explorers and settlers. Some of my most recent research has found information that supports the fact that maybe the wild horses did not disappear from North America. Interesting! 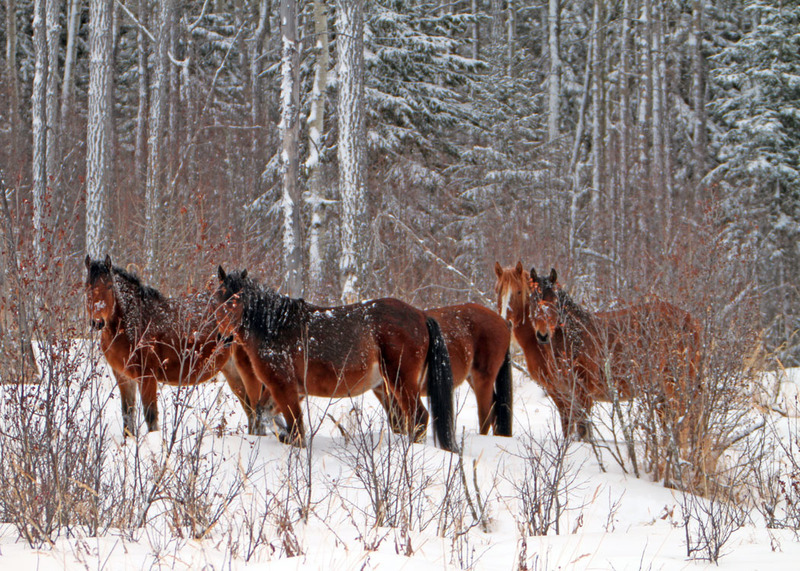 I will be updating the website and adding some new pages with one of them being this research and the history of the horse in Alberta and there will be also one on wild horse behaviour. I do hope to have these ready soon. Just a couple of questions. Lots of people are calling these horses “feral”. That means a horse that was once domesticated, that has now gone wild. I would think that number would be quite low, and certainly and foals born from a feral horse, would now be wild naturally. Also is there any proof that some of those horses are feral, ie. brands, etc.? Also, do the cattle ranchers have to buy a licence to graze their cattle on Crown lands? If they do, is it possible to obtain a licence to graze the horses, and perhaps that would be a way to stop the killing and round-ups? Just curious, as I’d certainly like to see them remain. I’ve heard it all when the Environment Minister said that since the horses were not here originally…they should be culled to control their numbers. If this was the case with other mammals here in Alberta, there are a lot of us that would be hiding in the bushes with those horses. Do we need to put them in our meatballs and glue ? Would they be more appealing to the Redford Government if they were pulling carts that carried oil? What happened to our pride in Alberta Beef? Leave the horses alone. I am so sorry to hear that the permits to capture the wildies have been issued. I have written to various Gov’t officials pleading their case-obviously we need more supporters. They are a beautiful example of our heritage and should be protected. Horses evolved on this continent and were likely exterminated by humans after the last Ice Age. Let’s not stand idly by and watch these wild ones be sent for slaughter.